During the 1790's Architectural samplers became very popular in Pennsylvania and houses began to appear either as a spot motif or as an intrinsic part of the picture. This excellent sampler by Elizabeth Hunt features a handsome double-chimney Federal house shown in three-quarter view that dominates the scene. The twin chimney, two story house with a gable roof might very well have been her own. There is a fan light over the front door and an elliptical window in the attic. The house sits on a lawn of long teal blue and green stitches with a shepherdess watching one of her flock. Upon closer look we find that shepherdess' face is painted, an unusual touch. The whole country scene is one of charm. These country scenes that included houses, shepherds and shepherdesses, flocks of sheep and sometimes other animals were becoming popular subjects for needlework and the tradition continued well into the 19th Century. During this period crinkled silk was applied in long stitches giving a lushness to the composition . . . the roof, the front door and the stepped lawn. The middle of the sampler contains several animals, including deer, a horse and a cow and another errant sheep. Perched high in the trees are two bluebirds. In the very center there appears to be a decorated pitcher and a basket of something (?). It appears she had pretty definite ideas on what she wanted her sampler to contain. Lest we not forget, she was only eight. Surrounding the sampler is an arcaded border containing vining flowers that frames the whole piece nicely. Our samplermaker , Elizabeth Hunt was the daughter of James Hunt and his wife Maria. 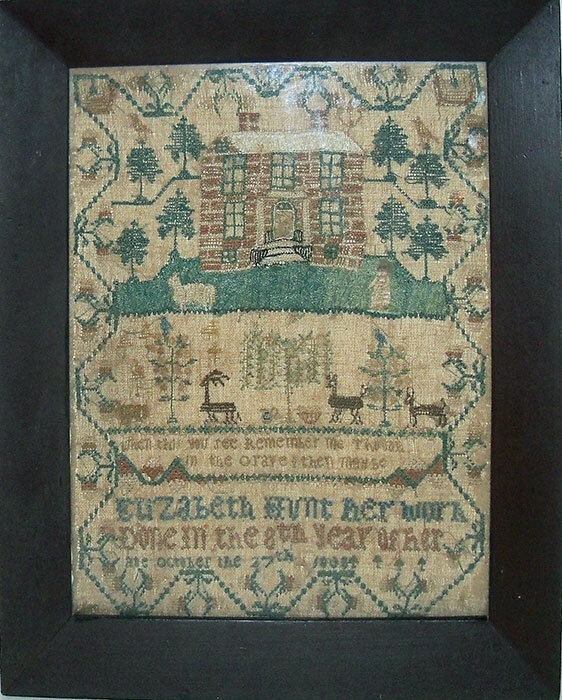 Elizabeth was born October 26, 1801 in Philadelphia, Pennsylvania and she signs her sampler "Elizabeth Hunt her work done in the 8th year of her age, October the 27th 1808". The sampler is in very fine condition and conservation mounted into what is most likely its original frame. Dimensions are 14-1/2 x 11-1/2 inches (sight) and 18-1/2 x 15-1/4 inches overall.